Sprint's trying hard to shake its underdog mobile carrier status, and its latest plan to snag subscribers is eye-catching. 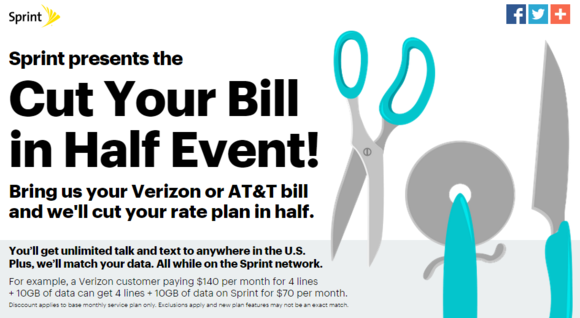 The company's Cut Your Bill in Half Event, which starts December 5 for a limited time, offers to halve the mobile device plans of AT&T or Verizon customers if they switch to Sprint. As the sale’s name suggests, Sprint says it will cut your cost for calls, text, and data in half. “For example, Verizon customers paying $140/month for four lines of service to share can get four lines of service from Sprint for $70/month,” Sprint said in its announcement Tuesday morning. Once you’ve got the new rate locked in, it’s yours for as long as you decide to stick with Sprint. The half-price event is not available to current subscribers. Why this matters: Mobile device plans in the U.S. are quickly descending into “Crazy Eddie” territory, with carriers offering aggressively discounted deals to lure subscribers. Sprint’s Cut Your Bill in Half Event follows an offer the company made in August that gave you 20GB of shared data for $100 per month. 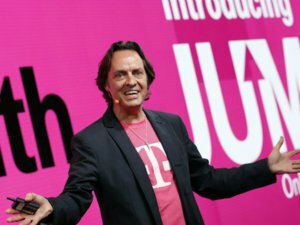 T-Mobile launched a similar deal in July. More recently, T-Mobile announced free voice calls and text via Wi-Fi, and AT&T doubled the data allotments on its family plans in September. Now here's the catch: AT&T and Verizon customers have to go through a multi-step process to take advantage of Sprint’s half-price offering. First you have to upload a copy of your current AT&T or Verizon bill to sprint.com/halfprice or bring your bill into a Sprint store. Then, you have to turn in all of your current phones to Sprint—there’s no cash back for the old handsets. The phones must be in good working order. If you don’t turn in your old devices, Sprint will ding you an extra $200 per line. Taking a look at your bill, Sprint will then offer you a service plan that most closely matches your data allowance from AT&T or Verizon. That sounds like you could end up with a little more or a little less data, depending on how Sprint’s offerings match up with those of your current carrier. All half-price deals include unlimited talk and text. Finally, you’ll have to buy new phones at the unsubsidized prices. You can pay for them up front or through Sprint’s installment billing. If you switch, Sprint will also give you a rebate for your early termination fees (ETFs) over at AT&T or Verizon. Sprint will pay up to $350 per line, which is the maximum you can expect to pay in ETFs from either carrier. To qualify for the ETF rebate, which is delivered as a Visa prepaid card, you’ll have to keep your Sprint account in good standing for 45 days; register for the rebate before March 15, 2015; and allow up to 12 weeks for your card to arrive in the mail. Sprint’s deal doesn’t offer any relief from taxes, surcharges, or other fees that always sneak into cell phone bills. This is purely about cutting your service plan cost in half, and nothing else. Sprint will, however, waive the activation charge as part of the deal.